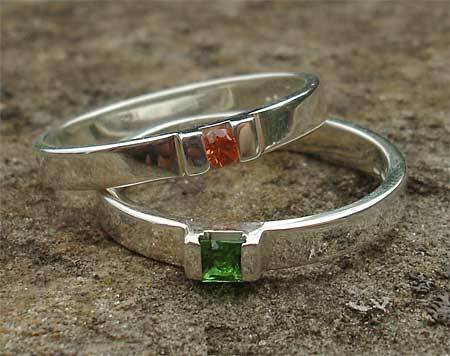 Green Garnet Silver Engagement Ring : LOVE2HAVE in the UK! A single princess cut Tsavorite green garnet engagement ring in silver. 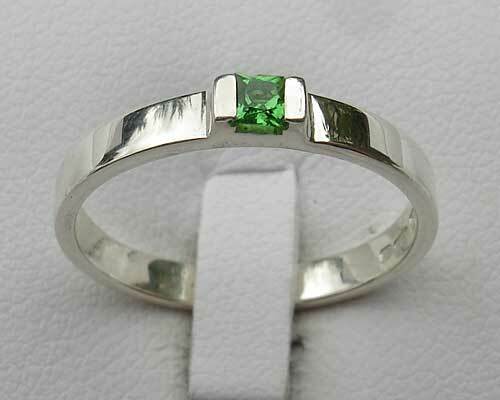 The ring measures approximately 2.5mm in width and the green garnet is 2mm in size. It comes in a polished finish, but matte is also available too along with different coloured diamonds. The designer chooses diamonds that sparkle and are full of vibrancy signifying to your future partner that you are genuinely committed to your future together. Fantastic UK designer styling for women and a matching wedding ring is also available, so please email us for further details. Affordable contemporary styling, from the silver range of precious stone silver engagement rings, this ring makes an excellent, UK made engagement ring if you find yourself on a tight budget but still want something special. The rings are not mass produced but are all individually handmade to the highest quality from hallmarked sterling silver. You never need compromise on quality and style when shopping online for your engagement rings or jewellery at Love2Have. Precious stone(s) Available: 1 x 2mm tsavorite green garnet.